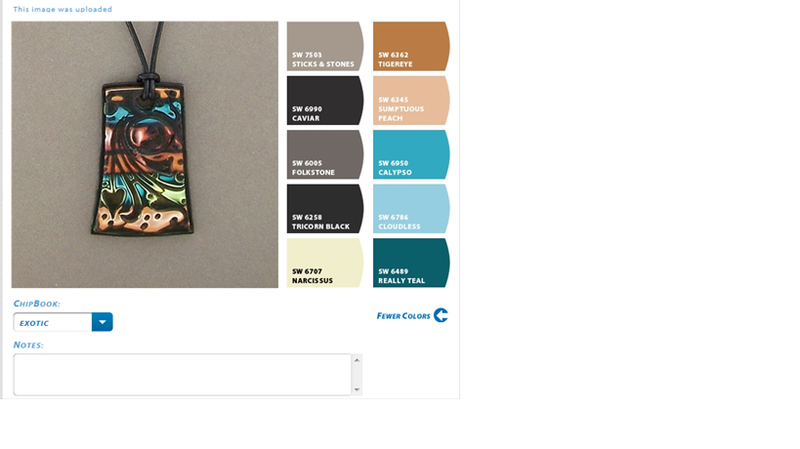 I was munging around on the web this morning and stumbled on a site that mentioned a tool that identifies the colors used in any image. I've seen other tools, but for some reason this one stuck with me. And...I apologize to whoever originally mentioned it since I have moved away from that site and forgot to make note of it. Thank you very much for the lead, though! The tool is called "Chip It" and it appears to be a Sherwin-Williams tool. It is free. You create an account, then upload an image and it shows you the color palette used in that image. You can save it so you can refer to it later. Here's a sample from a polymer pendant I made using Albina Manning's Hidden Flowers Tutorial.